They say that imitation is the sincerest form of flattery. 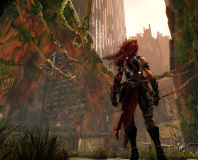 If this is true of THQ's new PC port of the hellish action/adventure title Darksiders, then a couple of key gentlemen residing at Nintendo's Japanese headquarters should consider themselves entirely flattered to death. See, Darksiders is one those games that's great fun, great entertainment, great to look at, but maybe a little too familiar to anyone that's played any of Nintendo's Legend of Zelda games from the last 20 years. 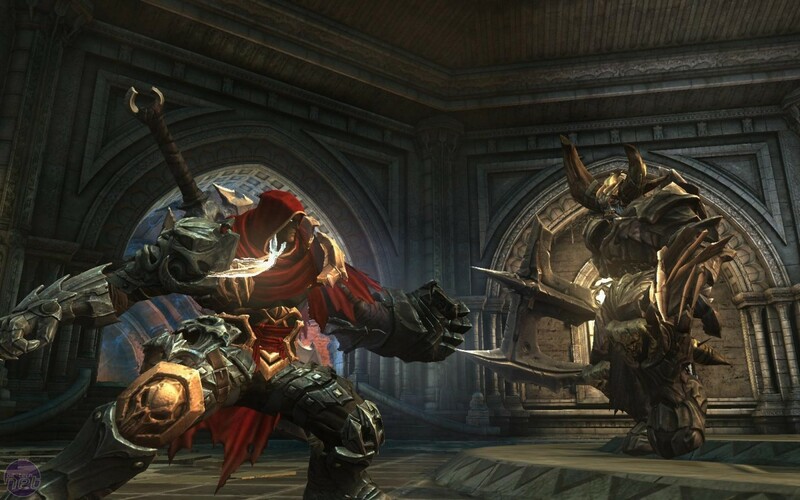 We're not the first ones to make this observation, given that the Xbox 360 and PlayStation 3 versions of Darksiders have been knocking around since early January, and this is certainly not the first game to mimic Nintendo's legendary series. But we just couldn't shake the feeling that we'd been here and done that (numerous times) before. However, at the end of the day, our impressions of Darksiders stood fast -- it's a fantastic 20 hours or so of puzzle-solving, bloodletting, ego stroking and carrot-dangling. So, did I fire six shots or was I using the infinite ammo upgrade? Well, punk? Any game that plonks you down in the hotter-than-Hell metal sabatons of the leader of The Four Horsemen of the Apocalypse, War, is going to pique our interest. And it just so happens that one of our favourite gaming experiences of the last 15 years is Nintendo's The Legend of Zelda: Ocarina of Time for the Nintendo 64, so imagine our elation upon discovering that a crude initial assessment of the game was 'Evil Link Does Demons in Hell'. How could it fail? 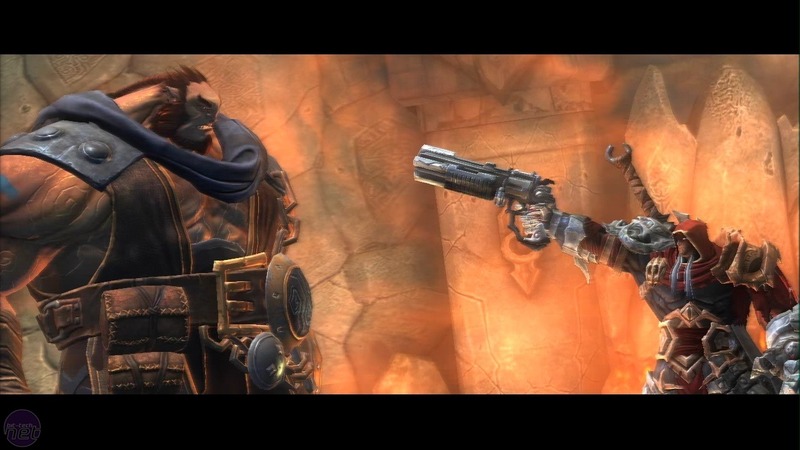 Basically, Darksiders doesn't fail - it wins. Trying to avoid using the word "derivative" is a very conscious decision here, as the game's homage to its console-based inspiration is not a bad thing like some would have you believe. The developers at Vigil have done a cracking job of taking some of the best elements of other popular heavy-hitters too, such as Capcom's Devil May Cry series, and more recently, Sega's Bayonetta. The over-the-top muscle-silly nature of War is splendid, and his adventures through a hellish, apocalyptical world in search of righting a rather nasty and very big wrong are carefully wrapped in a stylish, great-looking and well-designed game. There are some issues though. 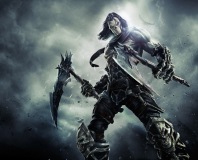 First thing's first -- don't attempt to play Darksiders without the use of a good joypad. It's a console game, people, so treat it as such, and you won't want to smash your keyboard and mouse against your recycling bin around the back of your house. By all means give it a go, but a joypad is the only way to really fly high with this release. The configuration options for Darksiders on the PC are probably about the same as its console brethren too. To put it another way, you can change resolutions, adjust brightness and fiddle with key mapping and sound levels and nothing else. Those of you with powerful rigs will yearn to be able to mess around with anti-aliasing, shaders and lighting, but no dice. The good news is that Darksiders is a good enough looking game out of the box so, on balance, there's not too much to moan about.